RJE Business Interiors: Office noise an issue for your staff? Consider a phone booth. Office noise an issue for your staff? Consider a phone booth. There is no doubt that the open-office concept has strong benefits for employees and companies alike. Open office concepts promote communication and idea sharing. They reduce overhead costs and help employees feel like more of a team. However, open offices can also decrease productivity and noise levels are a common complaint. Sometimes those noise distractions can increase stress, fatigue and negatively impact overall performance. What if you could offer employees a fully enclosed, comfortable, work space that was sound proof and easily accessible from their desk whenever they needed it? Those employees could now alleviate the stresses of noise levels... take phone calls in peace... handle personal matters without taking too much time away from their jobs. Does that sound like something that would be of value in your office? Enter: the Phone Booth by Framery. Yes, a phone booth. Trust us on this one - it's pretty amazing. What is the Framery Phone Booth? Dismiss any notions of phone booths that you have in mind. This phone booth is compact in size but roomy enough to be comfortable. It offers privacy and the opportunity for uninterrupted work. It comes ready to work with a table top, air ventilation system, electric socket and LED lighting. All this and the phone booth is an attractive, inviting piece of office furniture! Come see for yourself! We have a phone booth set up and ready for you to try out in our Cincinnati and Indianapolis offices. The booth will be making a guest appearance at our Ft. Wayne office April 10 - 15 before it returns to its standing engagement in the Indy showroom. Get more information and special offers. Why do you need a Phone Booth in your office? The value of a quiet space in today’s working world is a big one. Quiet space for in-depth work calls. Quiet space for personal calls. Quiet space to hammer out that last part of the project that has been nagging at your to-do list. Quiet space is valuable and desired and the O Phone Booth gives you quiet space. Work calls: Have you ever been on a call with a client or prospective client and the background noise in your office makes it impossible to hear? Or you find it hard to concentrate on resolving a client’s issue because of the conversations your co-workers are having all around you? Instead of frantically waving your hand at people or throwing pens at them to keep it down (hey, it happens), move your call into the phone booth – a literal oasis of quiet in the middle of your office. Convenient and just what you need to get the job done. Personal calls: Life used to be all about the work/life balance but today we all know it’s really about work/life integration. The lines between home and office are blurred and sometimes you just have to make personal calls during the work day. A conference call with your child’s teacher. A medical call for you or your parents. Now you have a place where you can take those calls in private. Trust us, it’s far more comfortable than the hallway or your car. Project work: Sometimes you need 30 minutes of quiet to bang out the last part of a proposal or pull together your thoughts for a new marketing plan. You might be able to use an empty office or conference room but even with the door closed, you’re likely to be interrupted by a knock or two. At first glance you might think the phone booth offers less privacy than an office with its clear glass door, however when people see that you are hard at work they are far less likely to knock and interrupt. The booth is just the right place to find your focus and finish the project. RJE Furniture prides itself on staying on top of the latest trends in office furniture. At last year’s Orgatec – the leading international trade fair for office and facility furniture – we first saw the acoustic phone booth and immediately realized its potential to make a simple yet powerful impact in today’s open space offices. In short, it’s not a phone booth so much as a private, flexible work space. 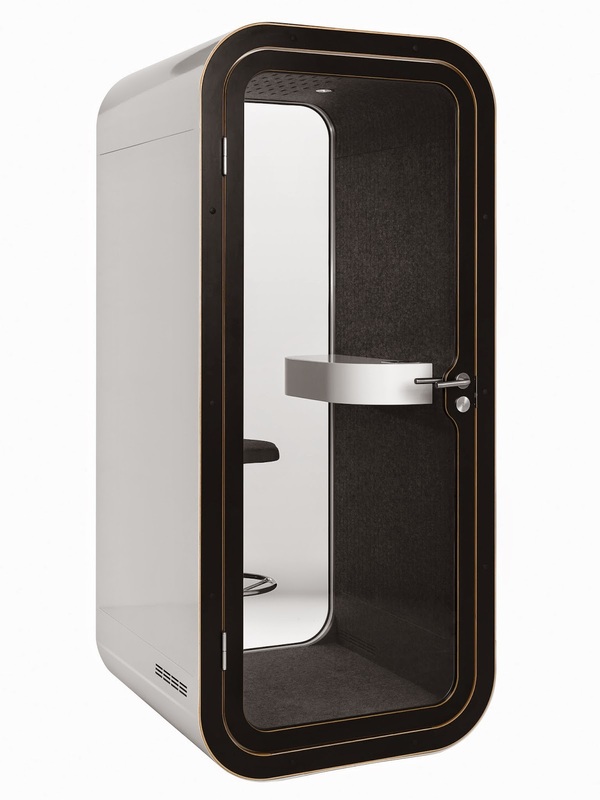 The O Phone Booth gives you a flexible, stylish piece of furniture that offers an echo-free, pleasant working environment. We recommend placing one phone booth for every 15 employees in a loud office environment. 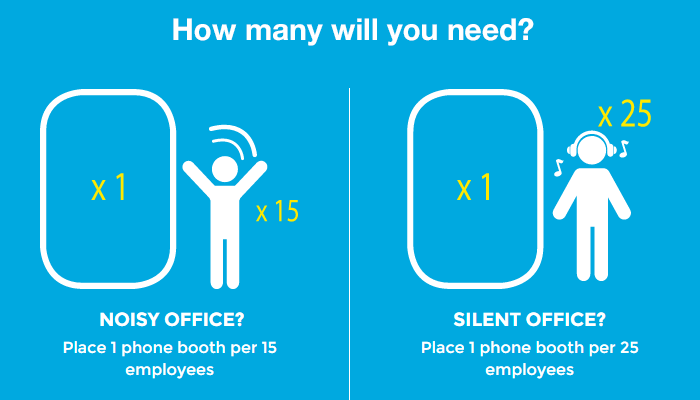 If you have quiet office policy, one booth for every 25 employees will work well. Want to learn more about getting a phone booth in your office? Let us help you look at your existing floor plan and determine the best number and placement for these phone booths.